Believe me, ladies and gentlemen, when you stand at the pinnacle of financial journalism, you’re standing at sea level. There are exceptions to the rule, of course. The Victorian polymath Walter Bagehot, second editor of The Economist, was one. The twentieth century Americans Garet Garrett, John Chamberlain and — my old mentor at Barron’s — Robert M. Bleiberg were others. Each brought something extraordinary to the prosaic business of financial and economic reporting and commentary. Then there was Henry Hazlitt (1894-1991), author, critic, self-taught economist and visionary. I stand before you in the reflected glory of his reputation. “Deflation,” too, is a perennially misunderstood term. It is not — as one so often hears it defined — a simple decline in aggregate prices. Let’s try a mind experiment. Suppose you lived in a time of material and technological wonder: of digital technology that sets robots to work, makes universally accessible the canon of human knowledge (and, to be sure, of human error) and coordinates and arbitrages the world’s far-flung labor markets. As it costs less to make things, so it should cost less to buy them. 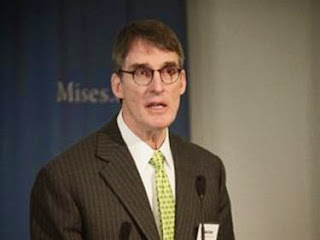 James Grant is editor of Grant’s Interest Rate Observer. See James Grant's article archives.